They were great to use. I would recommend them. The gentleman who helped me seemed helpful and was very thorough. He provided the exact service I asked him to do and answered all of my questions. If you need any plumbing services, I would highly recommend Duncan Plumbing. They are very courteous, on time, and they do what they say they are going to do. They charge what they say they are going to charge, never more. Since the first time I have used Duncan Plumbing, I have never used another plumbing service. They have fixed anything I have ever needed the first time out. They were very honest with their estimate, they gave me a good rundown of what needed to be repaired, and they did a very good job of communicating effectively with me. The owner was the one who came out on site and he and the staff member he had on site with him were very friendly guys. Duncan Plumbing Ent., Inc. provides a wide range of plumbing services for residential and commercial clients throughout Santa Cruz County. In addition to handling general plumbing work like drain clearing, fixture repairs and water heater installations, the company has the training and equipment to offer specialized services like radiant heating system repairs, sewer line inspections and repairs, and copper and PEX repiping. 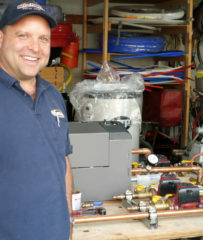 Owner Scott Duncan says Duncan Plumbing’s customer-oriented business approach has been a crucial aspect of its success. “From the time a customer calls us to the time we complete the job, their satisfaction is our number one priority. We fix problems in a timely and efficient manner, and we follow up after each service call to see how everything went. Our customers really appreciate how attentive we are to their needs." DIAMOND CERTIFIED RESEARCHED CAPABILITIES ON Duncan Plumbing Ent., Inc.
Company Name: Duncan Plumbing Ent., Inc.
DIAMOND CERTIFIED RESEARCHED ARTICLES ON Duncan Plumbing Ent., Inc.
"We're dedicated to providing prompt, courteous, professional plumbing services for the residences and businesses of Santa Cruz County. We pride ourselves on customer satisfaction and attention to detail, and we make sure all our technicians are up-to-date on the latest plumbing codes, technology, and repair techniques." 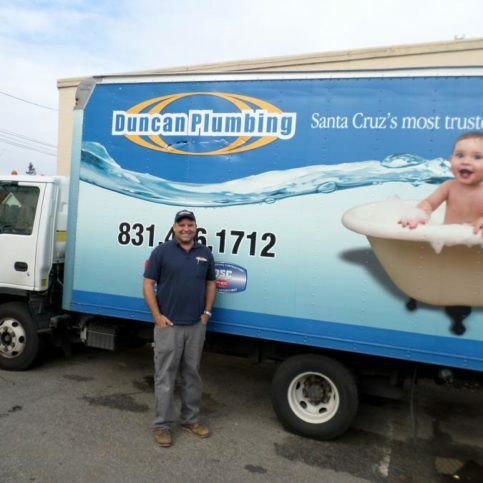 Duncan Plumbing has been providing plumbing services for residential and commercial clients throughout Santa Cruz County since 2000. The company has the training and equipment to handle everything from drain clearing to water heater installations, and it’s also qualified to offer specialized services like sewer line inspections and repairs, PEX and copper re-piping, and radiant heating system repairs. Q: How much will it cost to fix my plumbing problem? A: It depends on a lot of factors, but once we come to your property and look at the problem, we’ll be able to give you an accurate quote. Often, plumbing problems have more than one possible solution, so by seeing your problem firsthand, we can provide a solution that works best for your situation. A: We’re usually able to come out either the same day or early the next day. However, the demand for plumbing service fluctuates during certain seasons, and that can affect our scheduling. Q: Do you charge for in-person estimates? A: If you’re within 20 minutes of our facility, we’re happy to come to your home or business during regular business hours at no cost. If you live further away, we may charge a travel fee, but other than that, it’s free. A: By the job. We find that approach gives our customers a better value. Q: Does my boiler need regular maintenance? A: Yes. With proper maintenance, your boiler should last the lifetime of your house. Since the Bay Area has a mild climate, we recommend adhering to half the recommended maintenance schedule: every two years rather than once a year. SELECTED PHOTOS FROM Duncan Plumbing Ent., Inc.
SANTA CRUZ — One of the most crucial components of a water heater is its sacrificial anode rod. Made from magnesium, aluminum or aluminum/zinc alloy, this rod serves one function: to attract and absorb corrosion and divert it away from the water heater tank (hence the qualifier “sacrificial”). However, even though it protects a water heater from rust, an anode rod can stop working after years of sustained subjection to corrosive activity, which is why it’s important to replace it on a regular basis (every four to five years). Fortunately, this is a maintenance task you can perform yourself. After shutting off the water to your water heater and disconnecting the supply line, use a pair of pliers to unscrew and remove the anode rod. Typically, the hexagonal head of the rod will be visible at the top of the water heater (if you have trouble locating it, consult your owner’s manual). Once the old rod is out, you can drop in the new one and tighten it in place with your pliers before reconnecting the supply line and turning the water back on. Since corrosion is a common cause of water heater failure, anode rod replacement is just as important as annually draining and flushing the tank. Most notable is the effect on longevity—proactive anode rod replacement can substantially extend and even double a water heater’s expected lifespan. SANTA CRUZ — Host, Sarah Rutan: As a crucial component in maximizing your water heater’s lifespan, it is important to periodically replace the sacrificial anode rod. 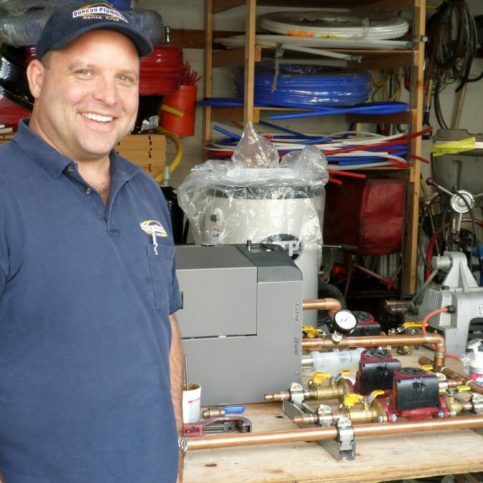 Today, we’re in Santa Cruz with Diamond Certified Expert Contributor Scott Duncan of Duncan Plumbing, to learn more. Diamond Certified Expert Contributor, Scott Duncan: The anode rod is a sacrificial anode that’s meant to corrode instead of your water heater. So, any electrical activity in your water or in your pipes will immediately go to this anode rod and it will corrode. Once it’s gone, once it’s fully corroded, then your water heater will start corroding. Today I’m going to show you how to extend the life of your water heater by changing the anode rod. First, shut the water off to your existing water heater. Second, you’re going to disconnect the supply line going to the water heater. Now you have to get the best pair of pliers you have. Next, we’re going to remove the anode rod. Now that we have our old anode rod out, we’re going to install our new one. I call this the nunchuck anode rod because it’s flexible and easy to slide in. Just take it and drop it right in your water heater, and screw it in there, and tighten it up with your trusty pair of pliers. And next we’re going to reconnect every – water supply and turn the water on. And there you have it. Diamond Certified RATINGS ON Duncan Plumbing Ent., Inc.
Duncan Plumbing Ent., Inc. : Average 8.9 out of 10 based on 175 unique customer surveys of customer satisfaction. I would say that when you call them, they get out here and they are dependable and they look at it and figure out how much it will cost. They are polite and professional. When they get the job done, they do what needs to be done. They were fast and they didn't make a mess in the house, they made sure that it stayed clean. They were quick, efficient, and polite. I would say to hire them. They answered the phones and they arrived on schedule. They told me what the job was going to be. They were quick and they were reliable. I felt that they were honest. They were quick and nice. Very professional and very kind, they are also thorough and helpful. They're wonderful. The man who came and helped, Noe I think is his name, he came to my house twice and he is just so neat and clean and kind. I like him so much, he is welcome in my home. He does a good job and he does what he has to do and he is quick, efficient and very thorough. Just that they are dependable and I would pick them again. That they listened, and they took care of my problem. It was a very personal experience with them. They took care of my problem quickly. They were able to just fix the heater instead of replace it, like the other companies wanted to do. They were easy, quick, and they came out when they were supposed to. They were friendly. They were very reliable and they did their job. I would call them again. I called them several times over the years and they always came quickly. They did their job and they were on their way. I don't want to tell anything to anyone. They were on time and their quality of work was good. They are reliable and they should use them. I would say, they are responsive and quick. I've used so many incompetent plumbers to fix this consistent plumbing issue in my house, and they finally fixed it. I would recommend them to anyone. I would say they are great to give them a call for a bid. The guys who came out were the best. I would say that I thought I knew the problem the guy was telling me otherwise and he proved this was the case. The worker was persistent with his knowledge of the problem and was able to prove it. I appreciated it. I gave them a tip because he was so great.